I’m participating in the Ratio Challenges this year, hosted by Seattlejo of Fat and Crafty, and experimenting with ratios from Michael Ruhlman’s Ratio: The Simple Codes Behind the Craft of Everyday Cooking . We’re reaching the end of the first Ratio period and I’ve learned a lot from working with it. 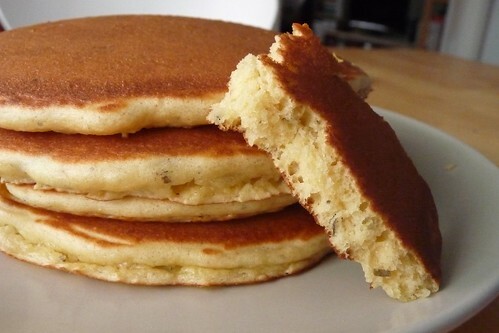 I’d always thought of pancakes as being an involved process, requiring recipes and plenty of time. Now I can whip up a batch of pancakes sized for the meal and number of people in nothing flat for breakfast, lunch, dinner or dessert — plus every single batch is completely and utterly different. The creative freedom that it allows me is tremendous! For instance, the recipe below came about while I was thinking up potential flours and ways to play around with the pancake ratio and my old experiments with chickpea flour and savory flatbreads came to mind. 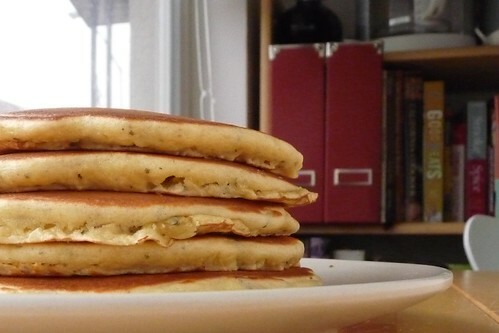 I’ve made chickpea flour flatcakes since I discovered the flour at Seattle’s Central Market. Back then, I would usually mix a one-to-one ratio of chickpea flour to water, add a pinch of salt and rosemary, then fry them up in olive oil. I’ve learned (thanks to Wikipedia) that creating a batter out of this particular blend of chickpea flour, water, olive oil and rosemary is known by several names in the Mediterranean, including farinata, socca and cecina. I’m not really clear on the distinctions, if any, between them. Wikipedia seems to say that most of the difference is cultural between different areas, such as Tuscany, where it is known as cecina, from ceci for chickpea. Of course, all three of these are traditionally oven-baked, so I’m not sure if or how skillet-cooking them fits in. The problem I found was when I tried to work the recipe into our menu. I couldn’t figure out what to make it with! So, I turned to an Italian friend of mine who hails from Tuscany and asked him how he enjoys it. He informed me that it’s eaten plain as a snack, much like pizza. (I do believe that he and I think of pizza a tad bit differently, but that’s a topic for another post!) I decided at that point to stop trying to force it into our dinner menu and instead make it as a super-fast side for lunch. I’d made my Three-Bean Vegetarian Chili for dinner the other night and my husband and I decided to have the leftovers for lunch. As it turns out, these little pancakes made a fantastic accompaniment! The strong flavors of the chickpea flour and herbs complemented the pumpkin, chile and tomato flavor in the chili. I don’t think I would eat these all by themselves unless I was really in the mood for a savory flatbread, but they were truly excellent with the chili. Combine wet ingredients in a small bowl, combine dry ingredients in a medium bowl. Add wet to dry and stir well. Add more water to thin it to a typical pancake batter if needed (this one did not for me). Heat a lightly oiled pan over moderate heat and fry until golden, flipping once. This entry was posted in american, dairy-free, gluten-free, italian, Ratio, recipes, untranslated. Bookmark the permalink.